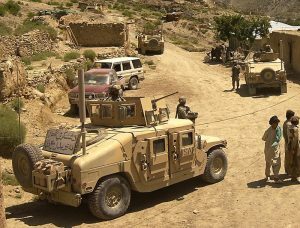 Manufactured by AM General, the High Mobility Multi-Purpose Wheeled Vehicle or Humvee as it is often referred to, is a mobile, four-wheel-drive, diesel tactical vehicle and serves at the core of the US Army’s wheeled vehicle fleet. 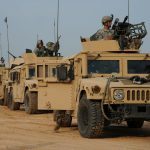 Incredibly modular, the HMMWV has 17 different variations from troop carriers to ambulances to weapons platforms. All variations, be they soft-skinned or up-armored, utilize a similar engine, transmission, and chassis. This allows for MOS 91Bs, Wheeled Vehicle Mechanics, to utilize a common set of skills to conduct service and repair to the entire HMMWV fleet without the need for extra specialization. Ever versatile, the HMMWV can be air-dropped, sling-loaded, or transported in the belly of various aircraft. In fact, three vehicles can fit in a C-130 Hercules and fifteen can fit in a C-5A Galaxy. 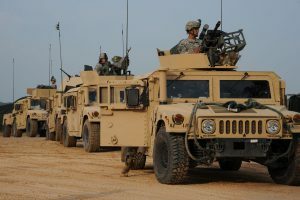 Development for the Humvee began in 1979 when the Army drafted new requirement specifications for their tactical vehicles. AM General was one of the companies awarded a contract to design prototypes for consideration. 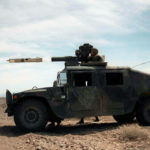 In 1981, AM General was awarded the contract to develop further prototypes for additional testing and, in 1983, AM General was awarded a contract to manufacture 55,000 HMMWVs. Of those, 39,000 went to the Army with the remainder for the other branches of service. The HMMWV first saw combat service during the US invasion of Panama in 1989, Operation Just Cause. 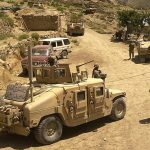 As the workhorse of the Army’s wheeled vehicle fleet, the Humvee has seen deployment in every major and minor conflict since. The HMMWV has an eight cylinder, 6.2L diesel engine with a three-speed automatic transmission. The engine is fuel injected and liquid cooled, generating 150 horsepower at 3,000 rotations per minute, delivering 70 mile per hour maximum speeds. It is also available in an eight cylinder, 6.5 L turbodiesel model with a four-speed. 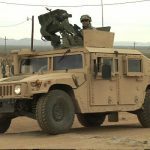 Humvees are especially maneuverable. They have a high, 16-inch ground clearance and a track of 72 inches. An outstanding off-road vehicle, it can scale 60% grades while climbing and can maintain a 40% side slope. 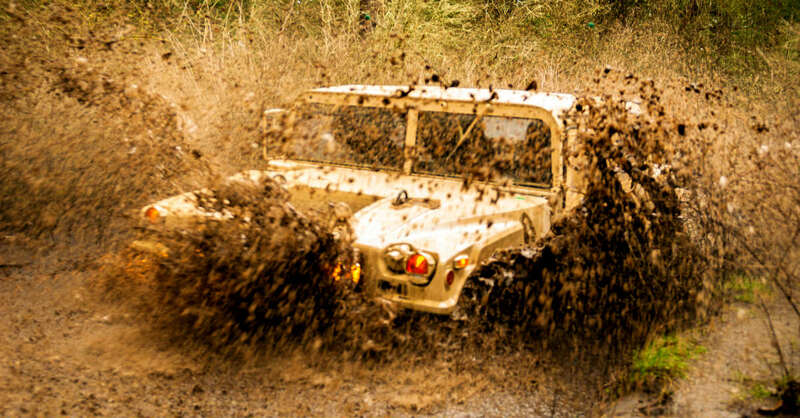 The HMMWV can also ford 60 inches of water. Soldiers from Headquarters and Headquarters Company, 301st Maneuver Enhancement Brigade, maneuver through difficult terrain on Joint Base Lewis-McChord, Washington March 12, 2017. The city of Tacoma, Washington, receives an average rainfall of 40 inches of rain per year. 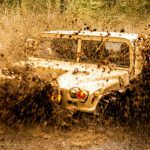 The independent suspension and steep approach and departure angles make the HMMWV able to handle rough terrain, but that doesn’t mean it can’t get stuck. Fortunately, the vehicle can be recovered by the use of tow-bars if assisted by another Humvee, or self-recovery with a winch (if equipped). This allows the vehicle to be recovered by others in its convoy, without the requirement for dedicated recovery assets. The M998 series of HMMWVs has a payload of 2,500 pounds, while the comparable M1097 has an even greater payload of 4,400 pounds. They also come in an Expanded Capacity Vehicle configuration, giving them an increased payload. These models, the M113 and up-armored M114, have a payload of over 5,100 pounds. These sturdy payloads allow the HMMWV to be a successful cargo transport, for its size. The HMMWV comes in a variety of configurations. Its modularity allows the vehicle to be used for a variety of purposes. Ambulances, shop shelters, and contact trucks (mobile tool boxes) can all be mounted on the HMMWV base. The vehicle can also fit a variety of weapons platforms. 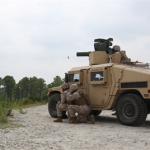 With the use of a turret ring, the HMMWV can be equipped with weapons such as the 7.62mm machine gun, the .50 caliber machine gun, and the 40mm grenade launcher. 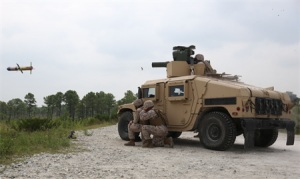 When used as a weapons platform, the HMMWV can carry TOW anti-tank missile launchers. 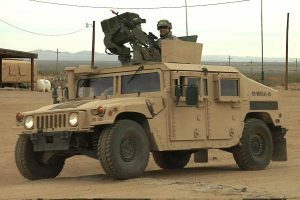 The HMMWV also serves as the platform for radar and air-defense equipment. 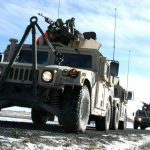 Despite the wide variety of configurations available, the base of the HMMWV stays the same. This allows mechanics to service and repair the vehicle, regardless of its configuration. Operators can also conduct most maintenance themselves, utilizing the -10 manual, and can perform any -20 level task under the supervision of a trained mechanic.